“You havent seen an Akshaya Patra kitchen in action?” exclaimed my sister when we were at our parents a few months ago. You have missed an extraordinary experience if you havent seen it, she continued! These words from my sister continued to haunt me until I was on my way at 4.30 am, eager to see the kitchen in full swing at 5 am in the morning. Akshaya Patra in Sanskrit means an inexhaustible vessel and true to its name this magnanimous institution feeds 1,281,664 children in 18 locations across 8 states of India. The Akshaya Patra Foundation (TAPF) which was set up in June 2000 reaches out to 8, 208 schools with plans to increase that number to hundreds more.The kitchens are divided into centralized kitchens where the cooking activities are concentrated in one large kitchen and decentralized kitchens where all the cooking takes place in an area near the school. Decentralized kitchens are set up in remote areas where it is difficult to set up large establishments due to lack of infrastructure. Most often, the mothers are employed to cook for hundreds of children infusing the food with a mother�™s love and creating employment opportunities for the mothers. That morning, when I walked into the centralized kitchen of The Akshaya Patra Foundation, Hubli, little did I know of the sublime experience I was in for. I was about to witness food cooked for a noble cause on a humongous scale in probably the world�™s largest kitchen to feed 180000 children in 775 schools. Ramgopal prabhu guided me through the various floors, the massive storage area where all the grains are stored, the vegetable cutting area and the cooking area which has 10 rice boilers and 8 sambar boilers and explained to me that each rice boiler cooks 110 kg (250 lb) of rice for 600 children in just 15 minutes and each sambar boiler cooks sambar for 6000 children in just about 60 minutes, about 1200 litres (320 gallons) of sambar in 2 hrs.This kitchen alone consumes 14 tonnes (31,000 lb) of rice, 3 tonnes (6500 lb) of pulses and 8.5 tonnes (19,000 lb) of vegetables every day. Nine different vegetables and a variety of pulses are used in the sambar to get adequate nutritional benefits. The kitchens of TAPF use several innovative and energy efficient methods like steam and gravity flow mechanism to cook food. 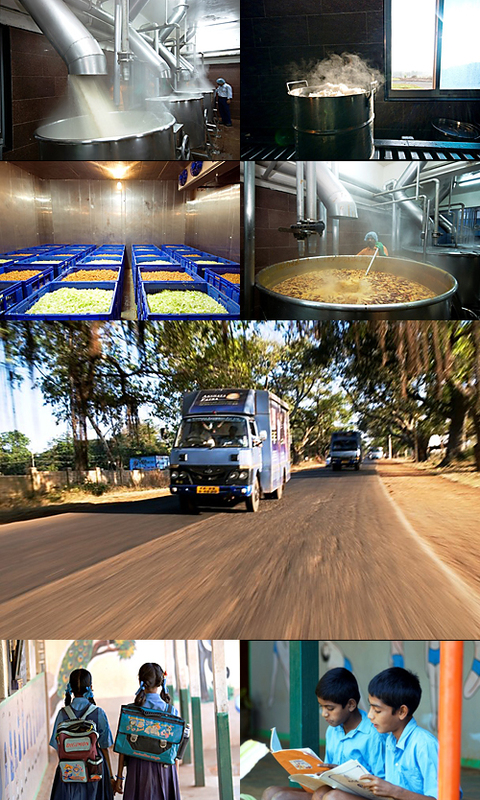 The cooked food is collected on the ground floor and packed into customized vehicles through a conveyor belt. The best part was to witness the cooking. Everything was kept spotlessly clean at all different stages of preparation and the environment was so pure that I felt I was on a different planet. Each day, even before the children are up for the day, the cooking starts at 3 am in the morning. By 6.30 am the food is packed in customized stainless steel containers that keeps the contents hot for about 5 hours and is despatched in insulated vehicles to reach the schools by lunch break. This ensures that children are served food that is hot at every meal. Each vehicle is accompanied by a supervisor who ensures the smooth operation and also takes feedback from the children and teachers each day. The menu is designed to cater to local and regional tastes and a specially prepared sweet is served every week. The TAPF is a secular organisation supplying mid day meals to Madrasas (Urdu schools). Infact the kitchen is kept open on sundays just to provide meals to children in these schools as Sunday is not a holiday to them. The kitchens of TAPF work tirelessly and round the clock to ensure that underprivileged children get nutritious, well balanced meals that are consistent in quality and hygienic, catering to local tastes and flavours. Begun with the initiative and vision that “No child in India shall be deprived of education because of hunger”, this program is partially funded and supported by The Government Of Karnataka and The Government Of India. When the basic needs like hunger are not met, education becomes the last priority. This is a strategic initiative to tackle two related issues, hunger and illiteracy by providing wholesome, nutritious and delicious food prepared under a stringent hygienic environment. It has been recognized by US president Barack Obama, is a case study for the MBA curriculum of the Harvard Business School for precise time management and for engineering its kitchens to prepare 100,000 meals in six hours, is on the Limca book of records for being “the world�™s largest school meal program” and has achieved several other feats and won many prestigious awards. TAPF is a transparent, professionally run organisation and its finances are audited by leading auditing agencies. A study conducted by A. C Nielsen shows increased enrolment, improved retention, enhanced classroom performance and improved nutrition status of the children being benefited by this wonderful institution. You can help feed a hungry child too and make a huge difference to the life of an underprivileged kid. Even a little help can go a long way! Once we saw the food get into the vans, I was eager to taste the sambar prepared that day. As if reading my mind, Ramgopal prabhu led me to Yagneshwar prabhu who looks after TAPF, Hubli and I was given to taste the food prepared that morning. A spoonful and I was mesmerized by the perfect taste achieved when food was prepared in such mammoth proportions. A melange of flavours coming together from the different vegetables, lentils, sprouted pulses, spices and a mixture of tastes, hot, sour, sweet and salty coming together in a mouthful created the perfect balance. Though simple, it was indeed food fit for the gods. Everything about that morning and the meal was perfect and couldnt be better. As I write this and think of the mind boggling quantities of food that are used to create such wonderfully perfect balanced meals, the precision with which such huge operations are handled and the smile and satisfaction that this institution brings to millions of children each day, I�™m filled with gratitude for having had the opportunity to witness one of the most amazing experiences of my life. I have tried to replicate the sambar served in the kitchens of Akshay Patra and modified the recipe to make it suitable for making in home kitchens. 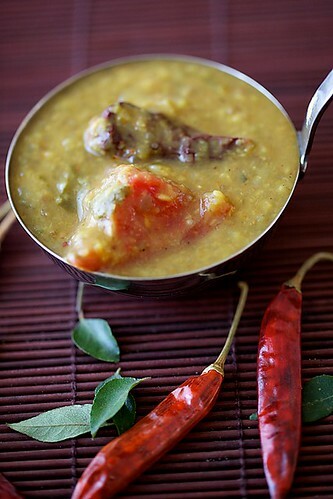 This sambar is not just great in taste but is abundantly nutritious brimming with vitamins and minerals from the vegetables, protein from the lentils and carbohydrates from the rice. You can use almost any seasonal vegetable here, all the ones listed below or a combination of few of these. You could even try preparing this with a single vegetable. This is best eaten with plain steamed rice. In a colander, over a running stream of water, wash the dals and or lentils. In a pressure cooker, assemble the dal, lentils or sprouts, turmeric powder, asafetida powder and vegetable oil along with the eggplant and water and pressure cook until 2 whistles. In the mean while prepare the tamarind. Wash the tamarind and in a small saucepan or a wok, put in the tamarind and the water and bring to a boil. Allow to cool. 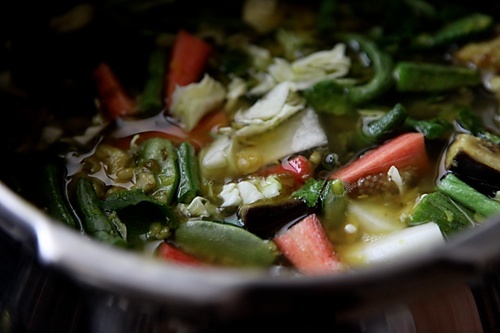 When the pressure drops, add the remaining vegetables and pressure cook until one whistle. When the pressure drops again, put in the tomatoes, jaggery and salt and cook on a medium flame for 5 minutes. Add in the sambar powder (mix with some water to prevent forming lumps), red chilli powder, lower the flame and cook for 5 minutes. Mash the tamarind mixture well, with a spoon or with your hands. Hands work best! Using a strainer, strain the tamarind pulp into the dal and vegetable mixture. 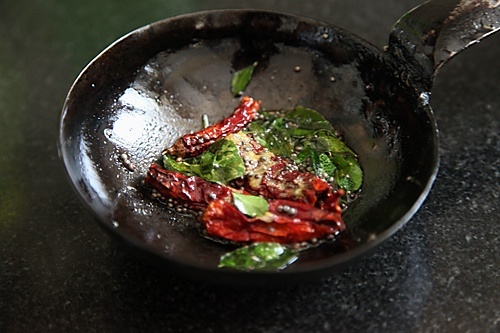 In a small wok, heat the oil for seasoning. 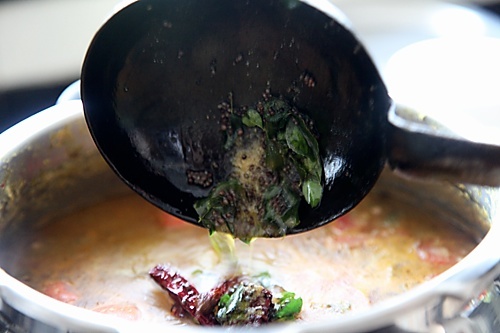 Put in the mustard seeds, dry red chillies and when the mustard pops, add in the curry leaves and the asafetida. Pour the hot seasoning into the dal and vegetable mixture. Mix well and serve hot with rice. Adjust the consistency of the stew with water to your liking, keeping it on the thicker or thinner side. I had been to the ISCKON temple here at west virginia and the guide over there told us a lot about Sri Prabupada, but he never mentioned anything about Akshaya patra. It was interesting to find out it was founded by him. It is a noble cause and i am glad you wrote about it. I am sure it will informative for many, like me and they probably will get more support. Thanks for sharing this. Akshaya Patra is mind boggling. I miss the energy of the place! Also the aroma of food wafting through the air as you drive up the hill, on the way to the office. It gave me the good feeling of hungry children satiated and ready to learn. 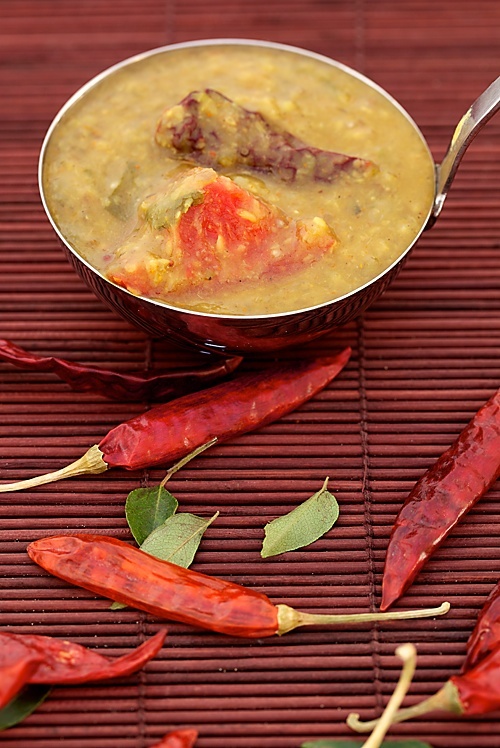 Love the picture of the sambhar with chillis- very neat! The hygiene, time-management, transporting fresh food and taking feedback from teachers and students are commendable. Thanks for making us aware of this wonderful institution and for the photos. Kay: Very well put! Those are the exact details which mesmerized me too. What a wonderful institution and the healthy recipes they share! Thanks for the info. Sambhar looks thick and delicious. It looks like an amazing experience. Ver interesting. Gorgeous dish too! Wow,thats a nice read,lovely post,with bunch of lovely pics,nice captures! And the sambhar looks very delicious! Thank you for writing about something so positive and giving us al the opportunity to be a small part of it. Everyday we read about so many negative things that is easy to feel hopeless about helping the world. I am indeed surprised by the huge number of children fed by TAPF. What a wonderful organization! I have been a silent admirer of your blog, but I felt compelled to comment today. Your writing and photography are both beautiful. Yet another visiual and informative retreat from Anu!!!! Do you know that you are a very good writer and you should take up writing seriously.It is indeed very difficult to say whether your recipes are more good or your photography and writing skills, everything is just so perfect and wonderful.even your silent admirers are forced to comment, is success anything different from this? I too had an oppurtunity to visit the Aakshay patra kitchen when I was in Hubli,the experience is indeed mesmerizing,the huge rice and sambar boilers,the way the rice is steam cooked and the perfect hygeine that is maintained all over is truly amazing.But the way you have created this blog by perfectly capturing everything abt Akshay patra in words and pictures is much more amazing to me,All I can say is pls do keep writing such posts. Vidya: I love to get feedback from my visitors and thanks for your beautiful words. Shruti: The best part of what I do is that I get to indulge in all three activities I love most, food, photography and writing. I'm really touched by your comment. Thank you very much. Akshay Patra is indeed mind boggling given its mammoth proportion kitchens and the number of children they are feeding.Its a great service that takes care of the most basic necessity of these children. wonderful post anu! love the topmost picture of the sambar with the chillies.. looks so appetising! My first time on this blog. Came across it accidentally while looking for some eggless recipes. I must admit was pleasantly surprised. Your blog is very interesting. Great content , beautiful pictures and all accompanied by lovely recipes. Old and new. I esp love the Sattvic cuisine addition. In short … I am hooked. Congratulations on a job well done esp when raising a toddler. Please tell the sambar powder recipe which is added here. This is a custom made sambar powder recipe. You can use any good sambar powder I guess.